Siblings are a blessing and a curse. It’s hard to live with them and impossible to live without them. They know you very well, well enough to torment you, and well enough to defend you, no matter what—also well enough to love you into death and beyond. I am the oldest of three sisters. There are approximately three years between us each. 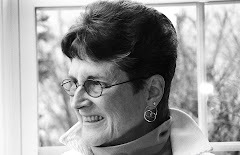 Our mother had three miscarriages before me and two before my younger sister, Laurie. Our youngest sister, Jeanie, died prematurely of brain aneurysms when she was 34, just five months before I would turn 40. She broke our hearts and broke up our troika. I have no idea if heaven is a state of being in which we two living sisters will see our “baby” sister, again, but it’s a nice hope. We have lots of love to catch up on, and lots of stories to tell, and lots of need to be we three again. When I moved away from "home" I gave many years of scrapbooks to my children and theirs, so I don’t have childhood photos of us three sisters to share, alas. Nor do I have a photo of Jeanie alone, although I wake up to see her face in a group photo with her husband and three children taken just before she died. Two out of three of us are alive today: Laurie (left) now, at 73 and me at 76. We have been through all kinds of hell and damnation. Okay, I exaggerate, but I’ve lost count of how many times we have broken up and tentatively come back together—just because we are sisters. Now we are old enough to embrace intimacy, and also be ourselves. Age helps some things. We both will probably live into 2019, 40 years after Jeanie died. Forty is a conventional number. In the Bible it is also a symbolic number, signifying a very long time. The Israelites wandered in the desert wilderness for “40” years. Jesus headed into the wilderness after his baptism. For “40” days and nights he discerned his vocation. It took a long time, but he decided to withstand the temptation to exploit others with his spiritual gifts. He would, instead, do the unifying work of God. It takes a long time to grow up and into unity. 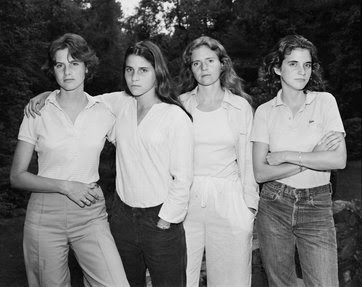 In a NY Times Magazine article, “40 Portraits in 40 Years” (October 3, 2014), Susan Minot wrote the story behind a series of photographs, taken from 1975 to 2015 by artist Nicholas Nixon of his wife and her three sisters. I have seen the exhibit; it is transfixing, this photographic documentation of sibling affection, sibling difference, and sibling aging. Over the years the annual photo became a project in which the artist and the subjects collaborated. 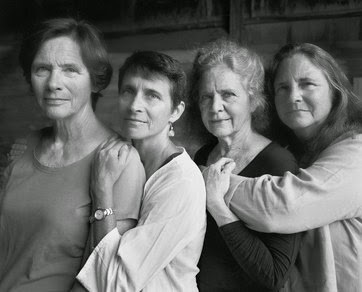 Without wardrobing or make-up, the four sisters stayed as they were, year after year, enduring together within the truth of aging. “Everyone won’t be here forever” was implied. This sisterhood admitted public observation, but not entry. It is remarkable that, in this age of the selfie, there does not seem to be evidence of attention-seeking. As I gazed at these sisters they gazed back at me, steadfastly. They had eye contact perfected, yet they never looked self-conscious. Sad often, showing signs of sibling wear and tear perhaps, but not possessed by their own image. Was this the way of these sisters? Or was it the skill and eye of an artist who knows how to catch the truth without fanfare? Probably both. There is something profoundly god-like in this last statement, something we humans who believe ourselves to be made in the image of God might take to heart.